Too many books hiding under your bed (or in the closet, or in storage boxes in the attic, or on dusty hallway shelves)? Having too many books is never a bad thing, especially when you can invent – as these interior designers did – ways to truly display the beauty of your literary collection. Utilitarian, appealing, and just plain classy, the following book displays take center stage. Get inspired to take your hidden book collection to a whole new level of literary household fame with these noteworthy designs. Many people buy old homes, only to find that the fireplace or wood-burning stovepipe is defunct. Some let it sit, acting as a decorative but non-function facet of the room, but some take a different approach. 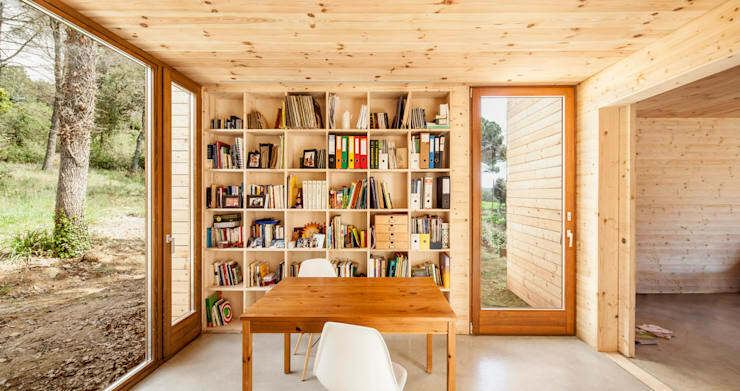 This home features a bookcase in an area that would traditionally house a friendly hearth, with the shelving niches along the top resembling a sort of mantle that you'd expect to find above. 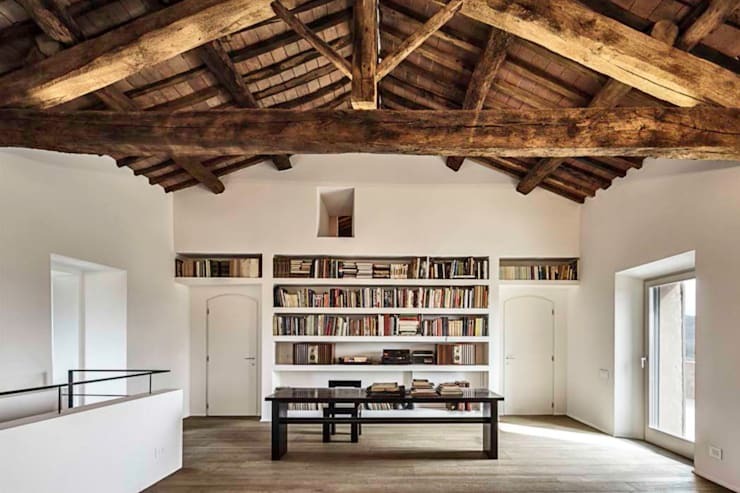 A view across this room offers a both stately and rustic feel, as the simple beauty of the books takes center stage, and a low table below affords a quiet reading spot. If you're considering updating your old fireplace, consider replacing it with a peaceful and balanced arrangement such as this! 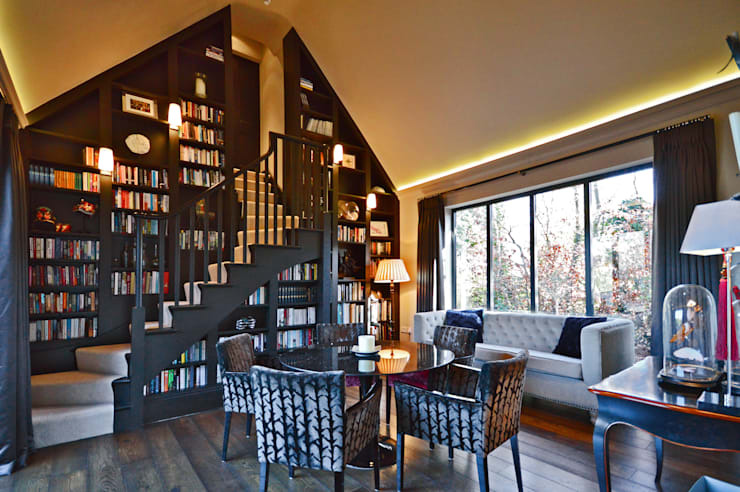 For homeowners looking to take advantage of height, an old-fashioned floor-to-ceiling library is a majestic way to showcase your extensive book collection. 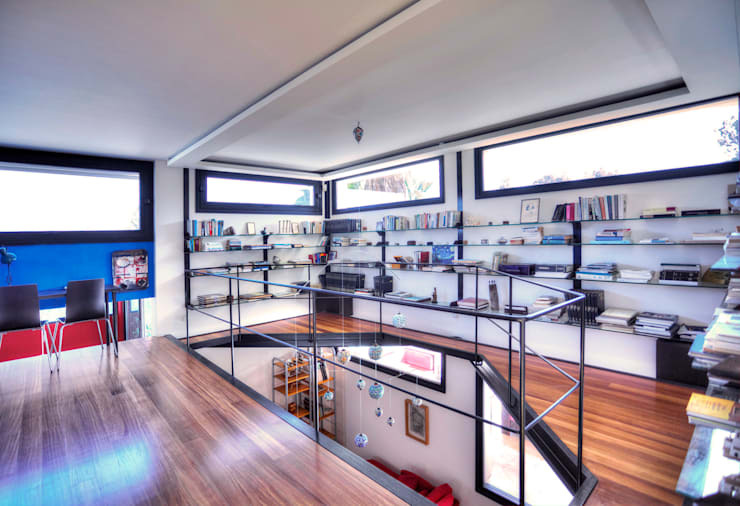 An antique ladder on wheels or a spiraling ironwork staircase (or the modern wooden version seen here) provides convenient access to all of your books. This isn't just a bookshelf – this is a majestic library reminiscent of old castles and stately historical halls. Why use one wall when you can use two (or three, or four)? This clever design draws the focus to the the length of the room, using strong parallel horizontal lines to visually emphasize its length. 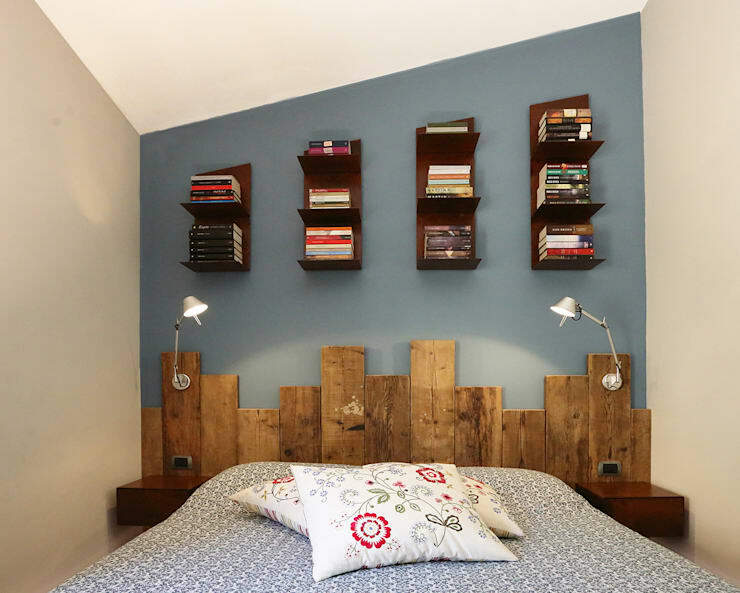 Bookshelves like these are flexible, able to serve many different storage purposes as your tastes and needs change over time, and there are many designs that are simply to affix to the wall with just a few simple household tools. A cubic cubby design is simple, low-maintenance, and utterly appealing in its symmetrical, no frills approach. This particular model takes the minimalist design one step further by employing the use of raw wooden textures to emphasize the less-is-more, laid-back design. This is an especially great layout for a home that is witness to many craft nights, as a cubby is an accessible way to store and categorize art supplies like paints and papers, as well as binders, folders, books, trinkets, fabrics, and other odds and ends. Such a symmetrical and ordered design brings a sense of organization and uniformity to your belongings – a great bookcase for a home in need of some de-cluttering. Here's a practical way to give a sense of separate space in a large room – a partition wall. But not just any partition wall! This one goes one step further, converting an aesthetic piece into a functional one by making it into a convenient mid-room bookshelf. This partition shelf provides a unique way to both peruse your books and shine a spotlight on them, as it's unusual to get the chance to view your books from both sides! These stacking shelves are becoming more and more popular, as they display your books with minimal hardware involved, creating a look that puts all the attention on the apparent free-standing stacks of books. The object that you picture when you imagine a book always displays a square or rectangular shape. Therefore, a storage structure that adopts a more organic, curvy shape has a surprisingly surreal and eye-catching appeal as a bookshelf. This wavy, spiraling shape displays a topsy-turvy theme as the bookends have been placed to allow the books to tip and tilt along the round edges of the shelf. 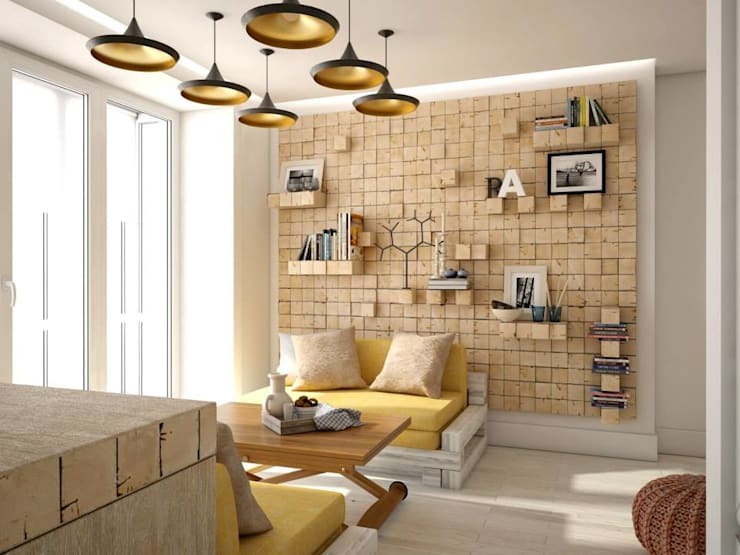 It takes some advance planning, but a living room brick wall can be made into a unique bookshelf offering a sporadic assortment of brick ledges for books and other items to rest upon, turning a flat wall into an engaging and unexpected place. 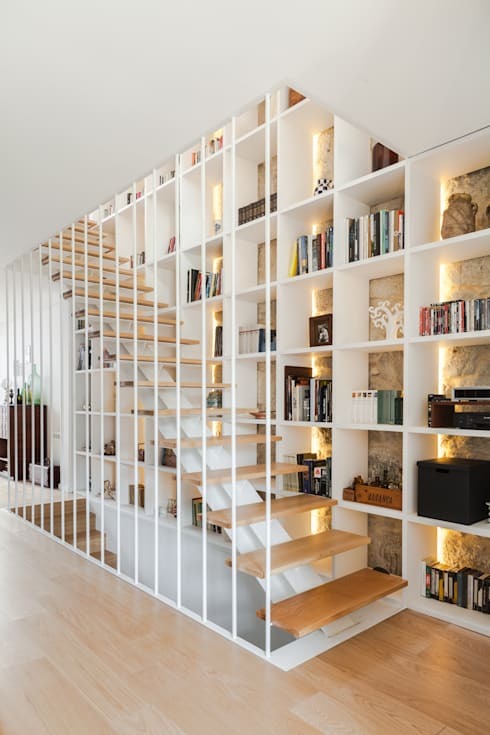 Obviously, half of the appeal of this bookcase lies in the see-through, airy design of the nearby staircase, but another element that truly allows this enormous shelf to stand out is the well-placed lighting that runs along the vertical lines, illuminating the niches formed within. Shedding some light on your books is an easy update that doesn't have to involve nails, screws, and boards – just a simple strand of bulb or rope lights will do the trick! 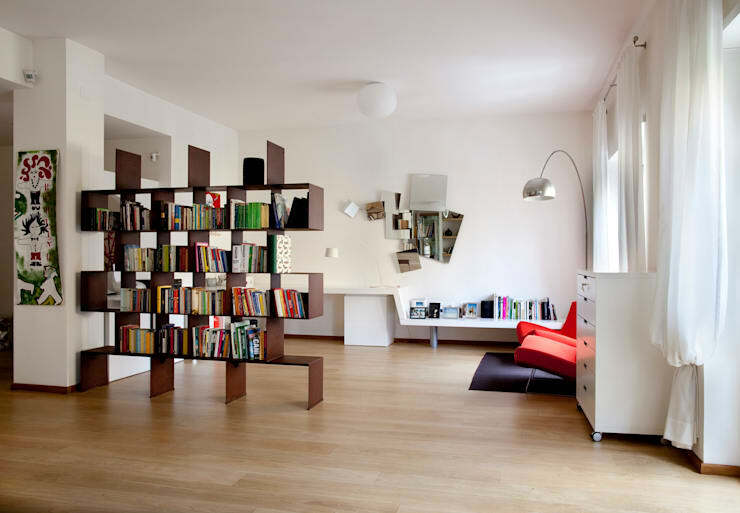 What do you think of these unique bookshelves? Share your insight below.